Who is it for? 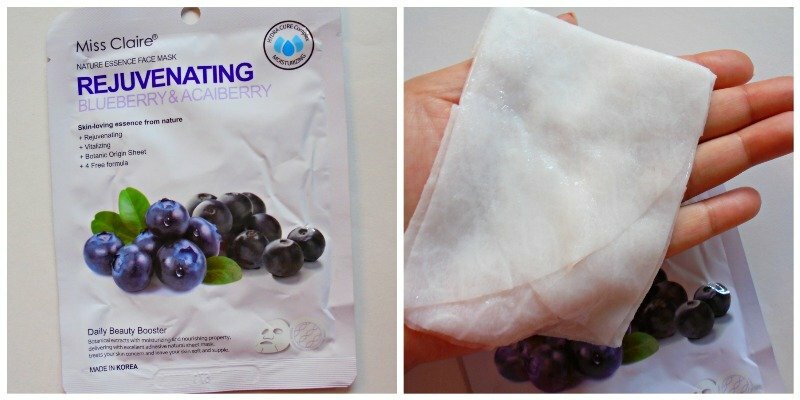 Miss Claire Nature essence Face Mask Rejuvenating Blueberry & Acaiberry is a nourishing sheet mask targeted towards dry skin that lacks moisture and elasticity. The mask comes in a white plastic packaging. On the back side, a detailed usage guide is provided. The packaging is very simple yet it is hygienic and travel-friendly. The mask sheet is of white color and made up of very thin cotton derived from eucalyptus tree fiber. It is soaked in colorless serum. The serum has thin consistency and but there is no drippiness. The mask and the serum feel comfortable and do not cause any irritation when applied. The mask sheet is textured with a pattern. It has a very light smell. It is free from intense artificial fragrance. This mask is designed for mature skin that has lost its capacity to trap moisture in the cells like young skin. This is why I tried this mask on my mom who has blemishes on her skin. Her skin type is normal to oily and she does not have dull skin. I applied it on her an after her nighttime skin cleansing routine. After 15 minutes her skin looked more radiant and healthy. The next day her skin felt rejuvenated and glowing but it did not last the day after. Overall it’s a rich hydrating mask for those who have normal to dry skin. It’s just a moisturizing sheet mask with no long term benefits on aged skin. I would recommend it as instant moisture boosting mask but not as an anti-aging mask. If you want to try any one of the masks from this range I would suggest this.